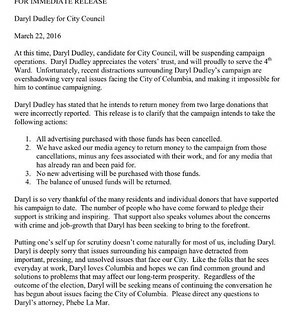 COLUMBIA, Mo 3/22/16 (Beat Byte) -- Embroiled in controversy over $60,000 in undeclared campaign contributions, Fourth Ward Columbia City Council candidate Daryl Dudley is calling it quits. 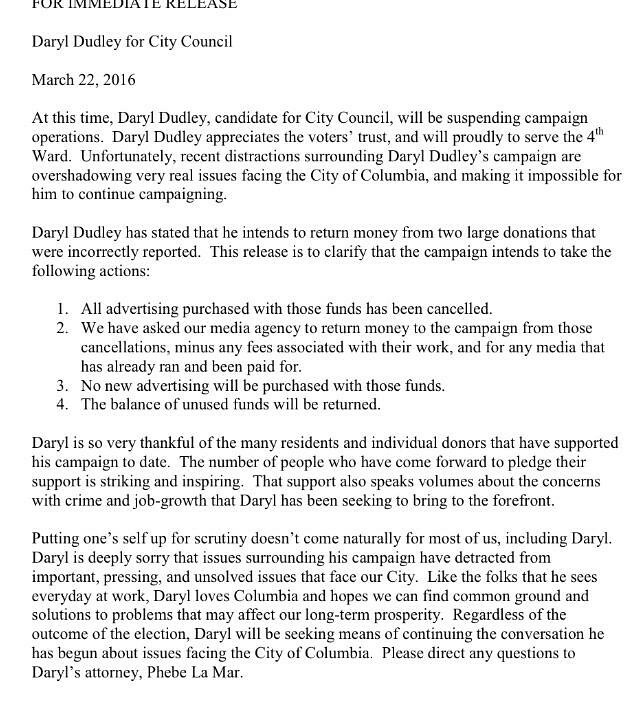 "Unfortunately, recent distractions surrounding the campaign are overshadowing very real issues facing the City of Columbia, making it impossible for him to continue campaigning," a press release issued this evening explained. Dudley's opponent, Ian Thomas, directed his treasurer, Richard King, to file a complaint yesterday with the Missouri Ethics Commission against Dudley's campaign. But the MEC never issues opinions prior to decisions, so their position on the complaint is unknown. Dudley's campaign received $50,000 from developer PAC Citizens for a Better Columbia and $10,000 from the Central Missouri Development Council, whose executive director is former Fourth Ward Councilman Jim Loveless. Candidates must report contributions of more than $5,000 within 48 hours, but Dudley waited a week. Also against Missouri law, Dudley failed to file any reports with the Missouri Ethics Commission, filing instead with the Boone County Clerk, where the reports were not readily accessible to the public and media. Dudley will be returning all of the donations, and cancelling all planned commercials and campaign ads, the press release explains. It directs inquiries to Columbia attorney Phebe La Mar, who is also a registered lobbyist. The election is April 5. Click press release above for larger image.